The wood of the Hawthorn has a fine grain and makes one of the hottest fires known, considered more desirable than even Oak for oven-heating. 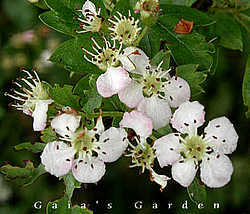 Hawthorn is a valuable medicinal herb and was a symbol of hope in the Middle Ages, when it was taken for many ailments. Often described as "food for the heart" Hawthorn is now used by Western Herbalists for heart and circulatory ailments, and has been used to remedy angina, heart arrythmias and high blood pressure as it is known to increase blood flow to heart muscles and restore normal heart beat. This current use stems from an Irish Physician who started using it successfully for such conditions towards the end of the 19th Century. Before then it was traditionally used in Europe to remedy kidney stones, bladder stones and as a diuretic. As is so often the case in Nature, the Hawthorn provides a remedy for those who fall victim to its thorns. Culpeper noted "If cloths or sponges be wet in the distilled water, and applied to any place wherein thorns and splinters, of the like, do abide in the flesh, it will notably draw them forth.."
In England the young leaves and berries of the Hawthorn used to be known as 'bread and cheese' [nothing to do with the taste - just in the sense that it was considered basic foodstuff]. The young leaves actually have a rather nutty taste, and the leaves and flowers have long been used to make a herbal cuppa long before the black tea we all know and love came to this country. An infusion of the flowers or leaves can be drunk to help restore blood pressure and protect the heart and Austrian herbalist Maria Treben recommends Hawthorn Tea for for headaches, poor circulation, and lapses of memory. Widely used in the past to bulk out more expensive teas - the following recipe for a popular country tea mix is taken from Barbara Griggs' The GreenWitch : "2 parts of dried Hawthorn leaves to 1 part each of Sage and Balm; or equal parts of Hawthorn, Sage, Balm and Blackcurrant leaves"
A decoction of the flowers, leaves or berries may also be used as a gargle for sore throats - and the berries apparently make a very good liquer brandy. There's plenty of folklore concerning the Hawthorn - connections with faeries, the underworld, May festivities - and in Britain there was a very strong taboo against bringing hawthorn into the house. In Celtic folklore the Hawthorn was often referred to as the faerie bush and it was considered bad luck to cut it for fear of offending the faeries that inhabited it. The exception was during May Day celebrations when the collecting of sprigs and flowers was permitted. In Ancient Greece crowns of Hawthorn blossoms were made for wedding couples and the wedding party would carry burning toches of Hawthorn. In Teutonic Lore the Hawthorn was a symbol of death and it's wood was used for funeral pyres. Interestingly, the association with the underworld and death, may have something to do with the chemical trimethylamine, which is present in hawthorn blossom - trimethylamine is one of the first chemicals formed in decaying animal tissue!
! Seek professional medical advice before using medicinally !